The encounter with the famous Indian musician Ustad Sultan Khan gave rise to this remarkable synthesis of oriental and western music. Sultan Khan, who first came to fame in the West when he performed with the Beatles, is nowadays the most significant sarangi player in India and a magnificent singer. The sarangi, an Indian violin, has always been a popular instrument for accompanying singing on account of its gentle, wistful sound. Combined with Felix’s warm, clear voice, it produces an atmosphere of longing which immediately enters the heart. The first part of the CD is a rhythmic piece in which the Sufi mantras sung by Felix Maria Woschek and Sultan Khan, interwoven with sensitive Sarangi improvisations, produce truly mystic music. The pulsating touch of Engelhardt’s masterly drumming draws the listener deeply under its spell. The style of the Sufi-Dikr enables the intensity of the music to rise over a period of half an hour from the tranquil „Alap“ mood to a state of pure ecstasy and finally, at the climax of its tension, to enter into the peace of perfect unity. The second part consists of a Sanskrit hymn to the Mother Godhead (Karunamayi) in the Alap style, and of two melodious bhajans (Hindu temple hymns). A production of the highest musical and spiritual level. 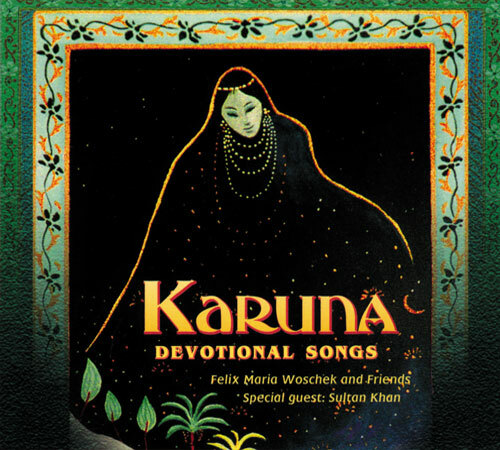 Woschek’s latest CD, „Karuna“, contains four longer pieces described as „Devotional Songs“. „Karuna“ The Call of the Sarangi! The sarangi is the Indian violin, an instrument which wakens the spiritual longing in us and conjures up images of ancient India. Woschek recorded this CD together with the well known Indian violin player Sultan Khan. The recordings radiate a harmony of east and west that is rarely so successful. The 25-minute long „Ya Qayyum“ is particularly suitable for carrying its listeners away into a deep trance. A CD for sacred, living moments which invites the listener to join in and sing.